Liquid Petroleum Gas (LPG) is stored in your gas bottle as a liquid. When the cylinder valve is opened some of the liquid boils off as a vapour. • A strong, distinctive odourant is added to help detect minor leaks quickly. • LPG is non-toxic, non-corrosive and clean burning, but if you inhale it in sufficient volumes it will cause suffocation. • LPG is heavier than air, so any leaking gas will flow downwards and collect in low spaces. Without ample ventilation and air movement, it will dissipate very slowly. • BBQ gas is different from automotive LPG. Never use automotive LPG for BBQ cooking. ¹NOTE: SWAP'n'GO gas bottle refills are sold by independent dealers who set there own SWAP'n'GO gas bottle prices. Please see SWAP'n'GO Prices for information on SWAP'n'GO gas bottle prices. • It is best to store gas bottles outdoors in a well ventilated space. • Gas bottles should never be stored indoors. • Gas bottles should always be stored upright. • Do not store gas bottles near an ignition source. As previously mentioned, the problem with charcoal is that it emits almost 3X the amount of CO2 that is produced when you use LPG. This greenhouse gas depletes the ozone layer which, in turn, increasesthe risk of skin cancers. Charcoal is also derived from biomass and creates much more smoke and particulates. Both have adverse health effects. A scientific study revealed that meats grilled with charcoal contained more carcinogens than meat heated with propane (LPG). These carcinogens are called polycyclic aromatic hydrocarbons - PAHs. Charcoal also burns hotter, charring the meat and creating HCA (heterocyclic amines) which is yet another carcinogen. So, propane grilling is arguably healthier than using charcoal. • Adequate ventilation is essential when using a BBQ to allow the gas to burn and burnt gases to dissipate. • BBQs should never be used near flammable objects. 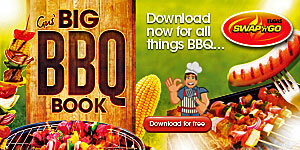 • BBQs should NEVER be used indoors because of the risk of toxic fumes, smoke or even fire. •Children should be kept safely away from BBQs and gas bottles. Maximum two bottles in enclosed vehicles. Do not exceeed. The leading cause of BBQ fires is equipment failure, leaks or breaks. • Use the correct type of hose. Do not make temporary connections. • Keep hose gently curved to prevent kinks and damage. • Cracked or damaged hoses and/or gas regulators should be replaced before use. • Check hoses to make sure they have not perished by brushing or spraying on soapy water and checking for bubbles. • Check hoses for blockages, such as spiders, which might have nested inside during winter. • Always read the BBQ manufacturer’s operating instructions. • Keep the BBQ gas bottle upright and on a stable base. • When done using your BBQ, turn off at the gas bottle first and then at the BBQ controls. • Always turn off the gas bottle valve when you’re not using your BBQ. • Remember, adequate ventilation is essential. • Be sure to shut off the bottle valve before disconnecting the bottle from the BBQ, even if you think the bottle is empty. • A safety valve is fitted to the vapour space to allow automatic relief of any excess pressure due to overfilling, or in the event of a fire. • Never tamper with the safety valve or other gas bottle fittings. • Do not use undue force to open or close the main cylinder valve. If in doubt, consult the supplier. • If any leakage from the valve of a small cylinder is detected or suspected move the cylinder to a safe location at least 20 metres from any possible source of ignition. • Keep flames and sparks away. • Check valve is turned off. Hose with water. • If it is not possible to stop the leak, keep the leak uppermost so that only gas and not liquid escapes. • Keep hands and face clear of any escaping liquid.